But that would be a waste for Chevrolet’s famous muscle car, especially in Grand Sport trim. 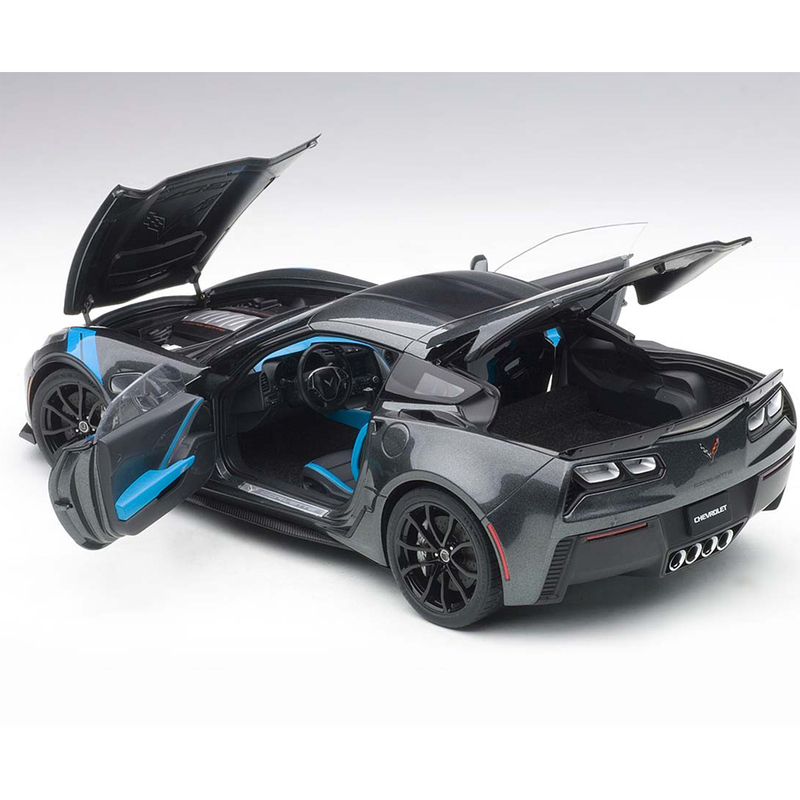 And in die-cast models, it would be shame not to encase Autoart’s 1/18 scale 2017 Corvette Grand Sport in an acrylic case or behind a display cabinet’s glass doors. It’s a beauty, and ours was the Watkins Glen metallic gray with satin black stripes from nose to tail. Crushing the graphics and styling norms, this one features electric blue hash marks on the outsides of the front fenders, and on the dash, console and seats inside. Wow! Corvette Grand Sports have come and gone since the 1963 racing season when the first five were unleashed on an unsuspecting sports car world. They were winners and set the tone for Corvettes for all these years after. The 1:1 2017 model keeps that performance DNA alive with a 0-60 mph time of 3.7-4.0 seconds, depending on whose foot is clamped onto the accelerator. 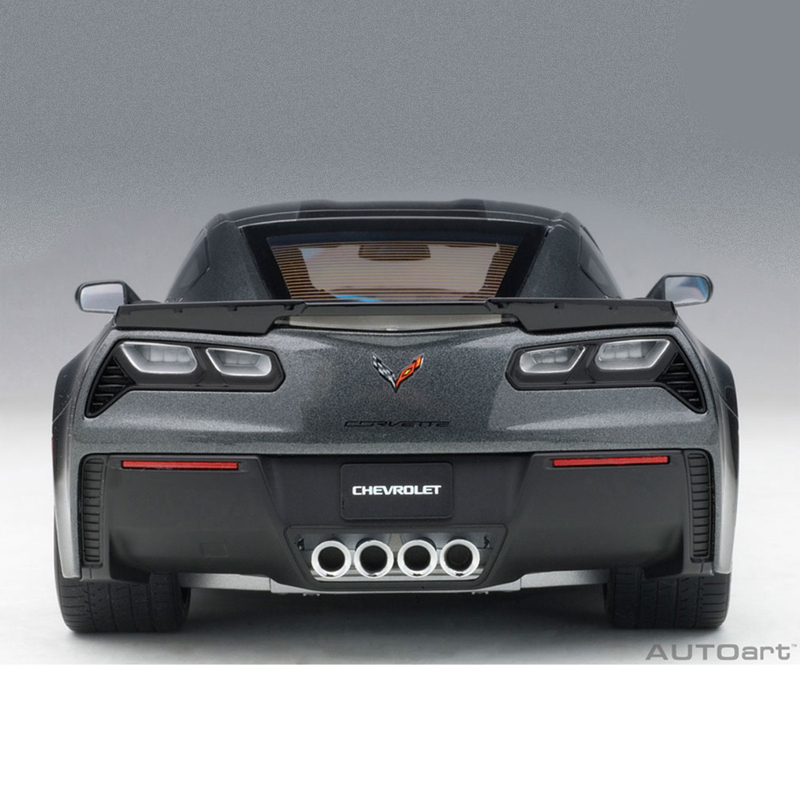 The Z07-based Vette is a full 3.5-inches wider than a standard model and weighs in between 3,500 and 3,600 lbs. Under the long vented hood is a naturally aspirated LT1 6.2-liter V8 with a dual-mode exhaust system that helps it make 460 horses and 464 lb.-ft. of torque. That translates into being about 0 .01 seconds faster in the quarter-mile than a Corvette Stingray . 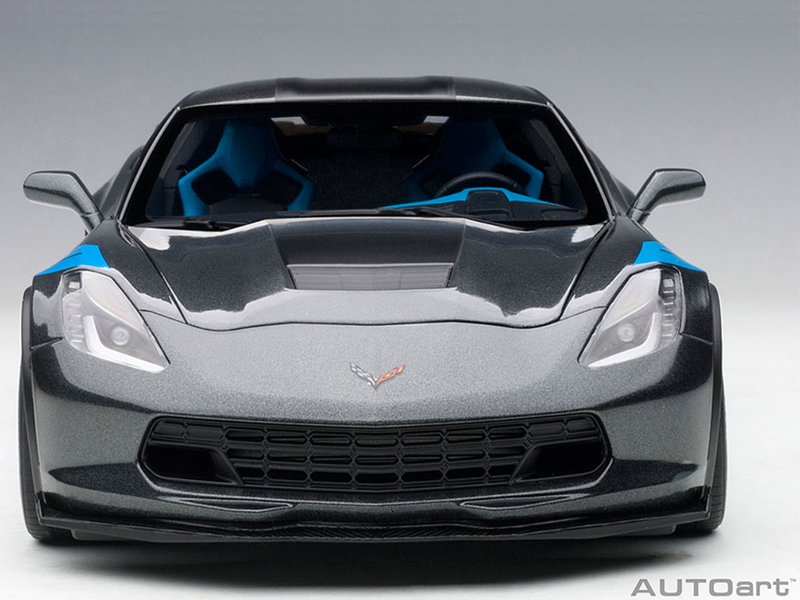 For those counting their pennies, a 1:1 model starts at about $66,500, about $10 grand more than a Stingray model. Keep saving! But this one is much more reasonable at $170 and replicates the Grand Sport with a manual transmission. The body is beautifully produced and proportioned with slightly flared front wheel well lips and flattened rear well edges. Both the hood and hatch can be lifted and both doors open too. And like many of Autoart’s models these days, the body is a composite material, not metal, so door and hood gaps are much more to scale. Details abound, with handsome headlights replicating the projector beam lights that rim the sleek front lights, mirrored faces for side mirrors and amber reflectors on the front fenders with red reflectors on the rears. There’s even the standard Michelin Pilot Super Sports tires with proper markings that blend in with the rubber tires. In back are four large chrome exhaust tips and defroster wiring in the rear window. The satin black racing stripe from the hood vents back is subtle and stylish. While inside is that blue trim that absolutely makes this interior pop. Sadly there are no seat belts in what look like Recaro racing seats. The dash looks good with all the gauges and buttons in the proper spots. You get the best overall view of this when the rear hatch is lifted. A few minor details have been missed though. The rear lights have clear, not red lenses and there’s no flat-bottom racing style steering wheel inside, just the standard round model. Likewise the rear spoiler is smooth whereas the Grand Sports I found on Chevy’s website all were raised on the ends to look like small winglets. Also, the Grand Sports on Chevy’s site mostly had red Brembo brake calipers. These are silver on the review car. The red would have clashed with the blue hash tag markings I suppose. 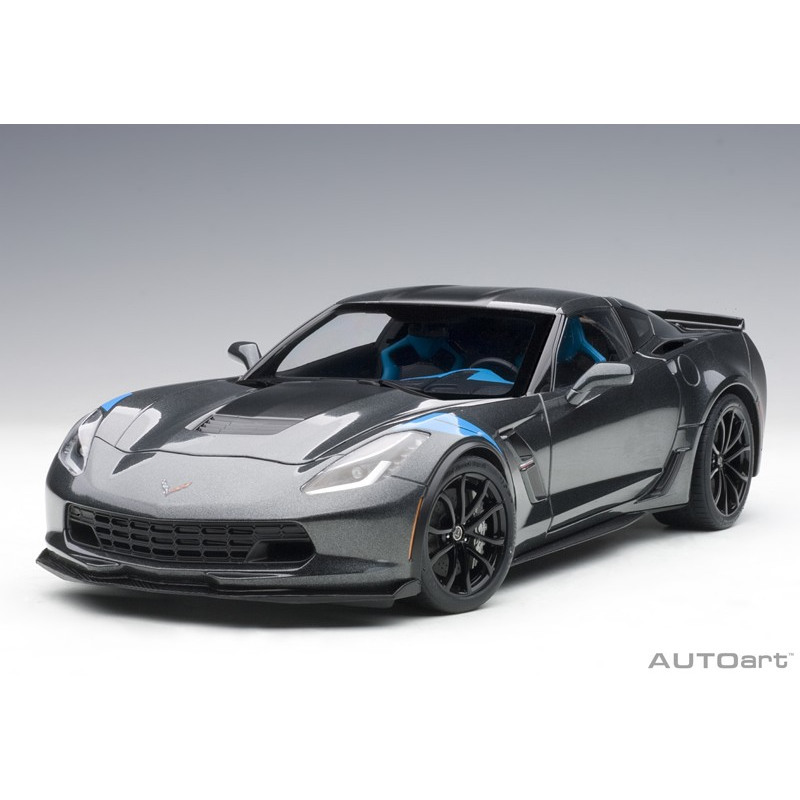 But these are niggling issues as the overall model looks stellar and if you raise the hood there’s even a moderately detailed V8 with Corvette emblazoned atop the headers. 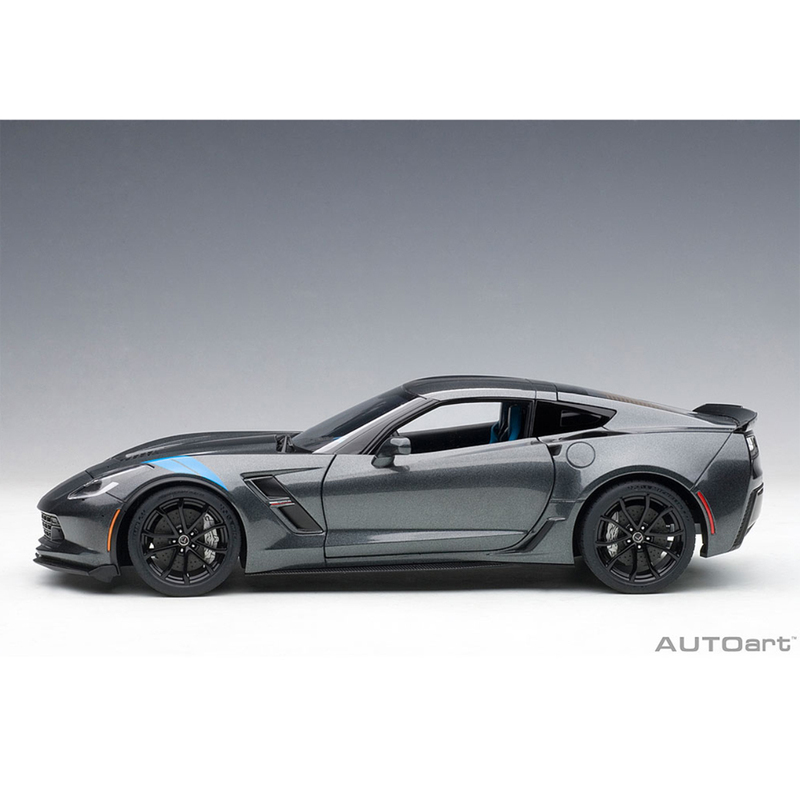 So if you’re a Corvette geek, this will satisfy your yearnings for speed.